African Ruby (Rnd) Twirl Earrings (with Push Back) in Sterling Silver 1.250 Ct.
African Ruby (Hrt),Natural Cambodian Zircon Earrings in Platinum Overlay Sterling Silver 11.500 Ct, Silver wt 6.61 Gms. AAA African Ruby (Mrq), Natural Cambodian Zircon Earrings (with Push Back) in Platinum Overlay Sterling Silver 5.000 Ct.
African Ruby (Ovl 9x7 mm), White Topaz Earrings in Rhodium Overlay Sterling Silver 9.150 Ct, Silver wt 5.00 Gms. African Ruby , Natural White Cambodian Zircon Filigree Earrings (with Push Back) in Platinum Overlay Sterling Silver 15.000 Ct, Silver wt 6.71 Gms. 9K Yellow Gold Checkerboard Faceted AAA African Ruby (Rnd) Lever Back Earrings 13.850 Ct.
Earrings add charm to your ensemble like no other piece of jewellery does. Put on a pair of Ruby earrings and you are set to take on the world with one look. Ruby is one amongst the four most precious gemstones known to man and as a tribute to its blood red intensity, has been christened as the ‘King of Gems’. Also known to be the gem of the nobility, Ruby has been the most sought-after gemstone of European royalty and the upper classes in UK. TJC brings to you the best of Rubies casted as stud, drop, and Diamond earrings at the most unbelievable prices. Fateful are the ones born in July, for they have Ruby as their birthstone. Possessing superior stimulating qualities and benefitting the wearer with the same, a Ruby has the highest value of all the coloured gemstones. If you want health, wealth, wisdom, and success in life, then Ruby is your stone. High quality and carats of Ruby sometimes are more expensive than even diamonds. Select a pair of Ruby earrings from the myriad styles – studs, drop, hoops, dangle, and climbers – that TJC has in store for you and be delighted every time you put them on. A symbol of love and passion, the red hues of a Ruby are sure to charm the wearer and the onlooker equally. The Ruby stud earrings owning to their petite size are a must-have for your ‘everyday’ jewellery collection. TJC has an extensive array of round, oval and cushion shaped Ruby earring studs set in Gold, Sterling Silver, Platinum and Rose gold overlay to suit the discreet style of the ladies in UK. Pick them as a gift for your loved ones or pamper yourself with a pair of Burmese Ruby today. 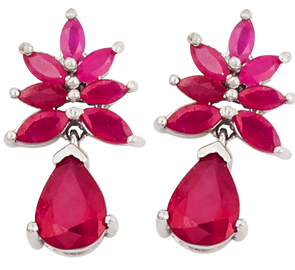 The Ruby drop earrings from TJC with colour like that of a rose plucked fresh from a garden, are an absolute delight. An epitome of sophistication, Rubies are also known to keep failure and evil at bay, don them for ensuring success in every task you undertake. Life is too short to wear boring jewellery, add a dash of drama with these red sparkles dangling from your ears. Chop-chop ladies, there is a piece for everyone. Looking for a statement piece to complement that designer gown you shortlisted for the annual gala? Admire chandelier earrings? Want to make an unforgettable first impression? Opt for Ruby and diamond earrings for they not only add to the persona of the wearer but also enhance the beauty of the jewellery piece too. Stand out for all the right reasons with your exquisitely designed pair of Ruby and diamond earrings from the TJC catalogue. Nothing can be better than owning two most desired gemstones amalgamated in a single piece of jewellery. Rubies have music in them; every piece speaks in a different way. At TJC we do not make jewellery, we create art, so which piece took to your fancy?